“The fans have shown me a lot of love. Everybody loves a good comeback story. Before I was just a sportsman but through all the trials and tribulations, I’ve turned into a real person. This is a fight for depression, mental problems. I’ve been as low as any man can go, and as high as any man can go. I’ve been to the brink, I’ve overcome.” – Tyson Fury, 12 April 2018. The above quote is taken from Fury’s London press conference to announce his return to the ring, which takes place this coming Saturday (June 9) at the Manchester Arena against Albanian Sefer Seferi. Fury sums up in just a few sentences the very essence of his upcoming bout. It is not simply a boxing match, but rather the culmination of a person battle for redemption. Fury’s fortunes began to nosedive within hours of him wresting the unified world heavyweight championship from former kingpin Wladimir Klitschko in the Esprit Arena in Dusseldorf, Germany on 28 November 2015. Upon his return to return to the UK there were many who appeared to be all too quick to dredge up ill-advised homophobic and sexist comments from Fury’s past, instead of crediting him for his exceptional accomplishment in becoming just the fifth Briton to hold a recognised version of the world heavyweight title. Despite numerous apologies for his words, more than 135,000 people signed a petition to have Fury removed from the voting for the 2015 BBC Sports Personality of the Year Award. Ultimately, Fury would remain on the ballot and eventually finished in fourth place. He would again apologise at the awards ceremony itself to “anyone who had been hurt” by his comments, insisting they had been made in a tongue-in cheek fashion. Fury, who is of Irish Traveller heritage, would later complain of having been the target of racial abuse since becoming world champion, stating his feeling that “nobody wants to see a gypsy do well”. A planned July 2016 rematch with Klitschko was scuppered when Fury revealed on 24 June 2016 that he had sustained an ankle injury in training. A revised date of 29 October that year was subsequently announced for the contest. However, on the same day that the injury was revealed, UK Anti-Doping (UKAD) would charge both Tyson and cousin/fellow fighter Hughie Fury with doping offences. Both men strenuously denied the charge and were free to continue fighting until an appeal could be heard. On 12 October, Fury would vacate his world heavyweight championships – due to mental health issues. “ “I’ve been out drinking, Monday to Friday to Sunday, and taking cocaine,” Fury told Rolling Stone magazine at the time. Fury also revealed that he had struggled with mental health problems for years. “I woke up every day wishing I would not wake up any more,” he admitted. Fury would again cite discrimination when speaking about the sources of his depression, stating that he and his family had been turned away from establishments. “I’m the heavyweight champion of the world and I’ve been told, ‘Sorry mate, you can’t come in, no travellers allowed’. 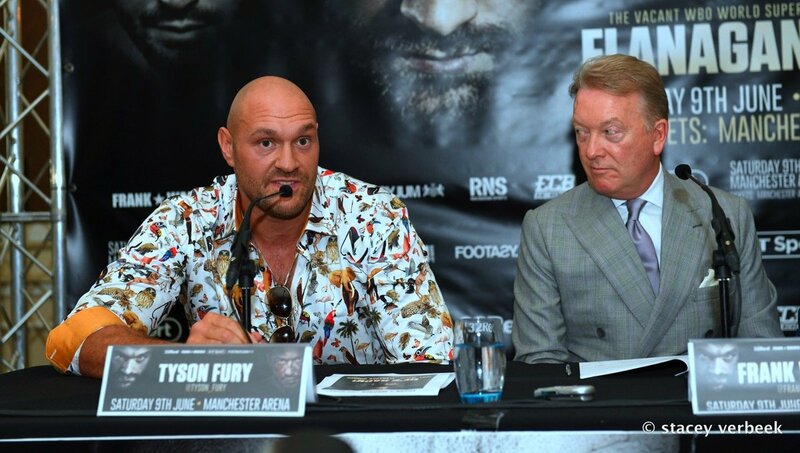 In response to both the UKAD charge, together with Fury’s own admission of mental health problems and recreational drug use, the British Boxing Board of Control (BBBoC) suspended Fury’s licence to box indefinitely on 13 October 2016. The case against Fury was ultimately bungled by UKAD from its inception. Both Tyson and Hughie Fury were charged with having tested positive for elevated levels of the banned steroid nandrolone – an occurrence the pair blamed upon eating uncastrated wild boar. (A similar defence was used by former Tour de France winner Alberto Contador following a failed 2010 test). Whilst the review process surrounding the charge was complicated by Tyson’s failure of a drug test for his previously admitted use of cocaine, the overall handling of the situation by UKAD was borderline farcical. The ongoing nature of the case meant that Fury was unable to reapply for his boxing licence, yet nor was Fury afforded the opportunity to formally respond to the accusations against him to bring the matter to a conclusion. Finally, on 12 December 2017, the case against Fury would be settled – with Tyson accepting a backdated two year ban from UKAD as part of a comprise agreement that would once again allow him to resume his career. Steadfast in his belief that he had done no wrong, Fury seemed simply relieved to put the whole scenario behind him. Fury’s boxing licence would eventually be reinstated by the BBBoC on 19 January 2018, nearly 26 months after he last set foot in a professional boxing ring. At the time of his victory over Klitschko, Fury was 27-years-old and entering the prime of his career. To be robbed of in excess of two years of his professional campaign at such a pivotal time – particularly without having the opportunity to formally answer the charges against him – seems most unjust. For a man battling depression, who has stated that “boxing is my medicine”, such a protracted saga must have been devastating. In addition to its mental effects, the enforced period of inactivity took its toll upon Fury physically as well. Fury reportedly ballooned up to to a high of 27 stone (378 lbs) during his hiatus and the very idea of a comeback was mocked by some when pictures of his physical condition emerged online. However, Fury would not be deterred. He worked tirelessly alongside his new trainer Ben Shaw, and had shifted in excess of 4 stone (56 lbs) of weight by May 2018, when promotion for his upcoming bout with Seferi began. Nobody will argue that a victory over Seferi in Manchester on Saturday night will propel Fury immediately back to the summit of the heavyweight division. The 39-year-old Albanian has spent almost his entire career at cruiserweight, fighting moderate opposition, and suffered his sole professional defeat on the one occasion that he did step up to heavyweight. It is, however, for Tyson Fury at least the first step of a journey of rehabilitation. Whilst he will no doubt be confident that this journey will lead him back to reclaim the heavyweight championships that he never lost in the ring as well as to a potential money-spinning fight with fellow Brit Anthony Joshua, he should take great pride in the fact that he has even made it back to a professional ring to begin with. Is Tyson Fury perfect? The answer to that question would be no – but in fairness he has never claimed to be. Everybody makes mistakes in life. What matters most is the steps that one takes to address those mistakes. It may not ever show in the record books, but, by simply entering the ring on Saturday night, Tyson Fury will be able to declare victory in the biggest fight of his life. Satisfyingly, judging by his own words last month, the man himself has a degree of appreciation for the magnitude of his achievement. Next boxing news: Santa Cruz vs. Mares 2: Can Abner Change The Narrative?